A few weeks ago, I came across a beautiful quilt inspired by Carmen Agra Deedy's 14 Cows for America. 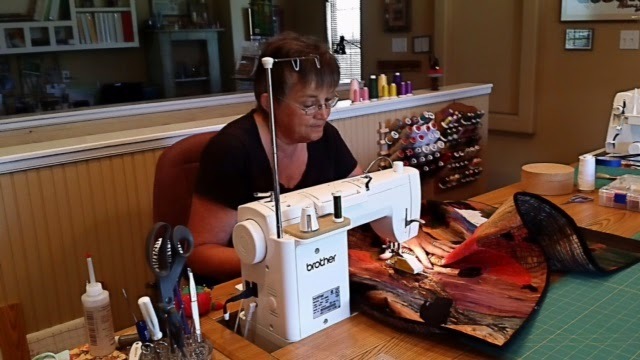 I was genuinely touched by the artistry and emotion it conveyed, so, in honor of this day of remembrance, I've invited Debbie Higgins--the creator of the 14 Cows quilt--to share the initiative behind it. 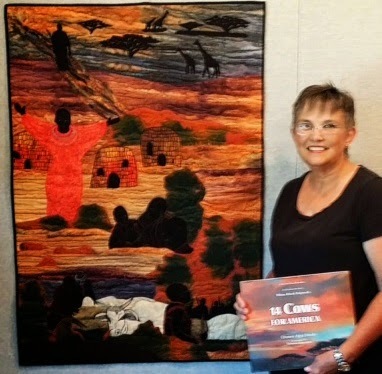 14 Cows for America… the perfect book for the central Colorado Valley Quilt Guild’s “QuiltedStories” project. The book, written by Carmen Agra Deedy, is a simple read about a very significant event. The illustrations by Thomas Gonzalez inspired me to create a quilt that would enhance the story. That mission is at the heart of our Quilted Stories program: instilling a love of quilts and art while promoting literacy in our hometowns. In January 2013, after the Greater San Antonio Quilt Guild’s presentation of their similar initiative, our members overwhelmingly pledged to support the creation of a CVQG chapter of the Quilted Stories program. We set to work donating money, books, quilts, fabric, and our love of quilting. We now have liaisons that furnish 18 area schools with a Quilted Stories bin. Each plastic bin contains 5 – 6 picture books and the accompanying quilts for use in the schools’ libraries and classrooms. At the end of each semester, the bins are rotated to another school. All sorts of beautiful storybooks—especially those with quilt themes—are made available to members by donation. Quilt-makers are encouraged to use their original designs along with traditional patterns. Each quilt is truly a piece of art. Our Quilted Stories project was showcased at the 2013 International Quilt Show in Houston to encourage guilds around the nation and world to start their own project. My quilt, depicting 14 Cows for America, was recently used in a workshop for upper-level teachers to demonstrate creative ways to enhance lessons. By incorporating a book and quilt into their plans, teachers can do anything from leading a unique storytime, to inspiring a writing project, to a presenting multi-media history lesson. I’ve seen how children absorb the story, almost becoming a part of it, when they have such a beautiful and large-scale visual to inspire their creativity and conversation. Because of the overwhelmingly positive feedback that we have received, the Colorado Valley Quilt Guild is continuing to create works of quilted art while enhancing great literature for children! How do you use treasured books creatively?